When your snuggle bunny needs a set of ears for her photos it is time to turn to your crochet hooks and whip up this Crochet Bunny Ears Headband with Flowers for a springtime flair. This free crochet pattern is quick and easy and great for beginners who have already learned the basics. I designed this pattern to be beginner friendly using basic stitches and techniques. Every little girl or boy deserves to be able to have their own rabbit ears. I have also have a video tutorial in the works in case you need an extra visual aid. For the Crochet Bunny ears Headband you will need to know how to chain, Single Crochet, work in the Back Loops only. The pattern also includes working into the side of a stitch but I have made that part optional. Let me tell you getting photos of this headband on my little snuggle bunny was a challenge. She wanted to hop (or crawl) every where and would not hold still. If you are a fan of video tutorials scroll to the bottom to the bottom to see the video tutorial for this pattern. For the yarn for this project, I just grabbed some Big Twist worsted weight yarn I had in my stash as well as some other size 4 yarn that I liked for the flowers. Any medium size or worsted weight yarn will work great for this project. Don’t forget to check out all my Free Crochet Patterns as well as one fun Spring patterns shown below. Ears stand 6.5 inches tall. You can watch the Left Handed Video Tutorial on Youtube. Child Size – Work a total of 63 rows. Young Adult – Work a total of 70 rows. Adult Size – Work a total of 77 rows. Fasten off and use your yarn end to sew the two ends of the headband together. Be careful not to twist the band. R11-26: Ch1, turn, Sc in the next 8 Sts. After Row 26 you can either Sc around the edge of the ear to create a finished look or leave it with a little more rugged edge. You can see the difference in the photo below. To work around the edge of the ear, Ch1 after row 26 and work a Sc into the side of each row of the ear. When you reach the top of the ear Sc into the opposite of the starting Ch and then Sc into the opposite of each row down the other side of the ear. Fasten off and weave in your ends. Again working around the edge give the ear a cleaner look but is not necessary. To work around the edge of the inner ear, Ch1 after row 26 and work a Sc into the side of each row of the ear. When you reach the top of the ear Sc into the opposite of the starting Ch and then Sc into the opposite of each row down the other side of the ear. Fasten off and weave in your ends. R1: Sc in the 2nd Ch from the hook, *Work 2 Hdc in the next Ch, Sc in the next Ch* Repeat from *to* a total of 9 times. Fasten off leaving a long tail to sew the rose together. Note: For the leaves we will work down one side of the chain, then flip the chain over and work down the other side. Feel free to watch the video tutorial for better understanding. R1: Sc in the 2nd Ch from the hook, Hdc in the next Ch, Sc in the next Ch, Slst to the last Ch. Turn the chain over so you can work down the other side. Slst into the next Ch, Sc into the next Ch, Hdc into the next Ch, Sc into the next Ch, Slst to the first Sc made. Fasten off leaving a long tail to sew to the headband. Use grey yarn and sew the inner ears to the front of the Bunny Ears. When this is complete take the bottom of the ear and fold it in half. Sew this in place just at the bottom of the ear. Assemble both ears and see them to the headband. I chose to sew my ears 2 inches apart but if I did it again I would place them right next to each other or about an inch apart. To Attach the Mini Roses and Leaves to the headband, you have two options. You can use the yarn tails from each piece to sew the leaves and flowers in place. I actually used my hot glue gun to glue the flowers on. I felt like this gave me more control over their placement. Please be careful using a hot glue gun. Once your flowers are attached your Crochet Bunny Ears Headband is complete! 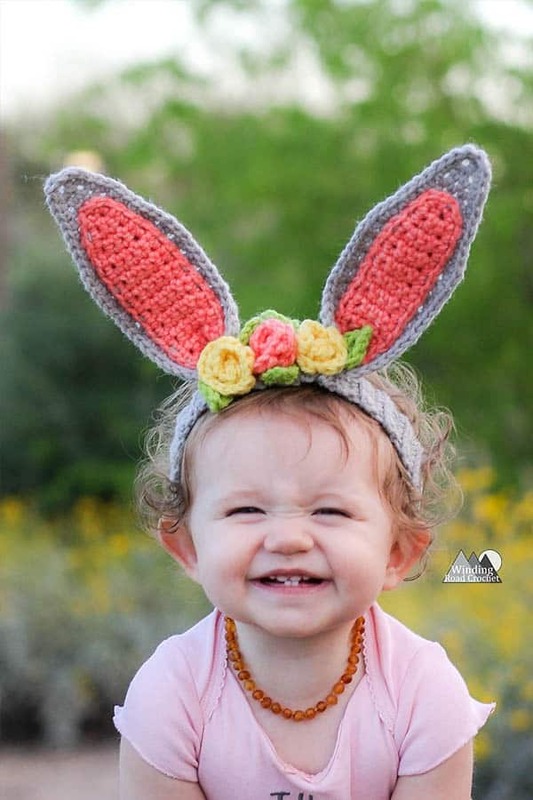 Are you going to make a Crochet Bunny Ears Headband? I would really like to see your finished piece, take a picture and share it with me on any social media! Just tag me @windingroadcrochet, #windingroadcrochet, or #ourcrochetjourney. Join my Facebook Group and share your creation with the community at Our Crochet Journey Facebook Group! Written pattern, tutorials, graphs and pdfs of the Crochet Bunny Ears Headband are copyright Windingroadcrochet.com. Please do not reprint or repost this content as your own, but please feel free to share this link with others. You can find more information on sharing my work with others in the Terms and Conditions Page. I am sure they will look amazing. I am so happy to be designing this patterns and I will get to have all the photos of her when she is all grown up. Did you use wire in the edges of the ears? I did not use any wire in the ears. I secured the flowers to the ears and to each other. You could crochet around wire when crocheting around the edge of the outer ear but I did not do this for my example.